VIDEO REPORT: Cyrus introduces all-in-one audio streaming platform | What Hi-Fi? You can now watch our video news report on the new Cyrus streaming range, click here. We've just had a chat with the guys from Cyrus and have garnered more details of the company's new Streamline range. All three models – Streamline, Stream XP, Stream X –support WAV, FLAC, AAC, MP3, WMA, AIFF and high-resolution 24-bit/96Khz files. They're uPnP and DLNA compatible, have wired Ethernet connections and wi-fi support. However, they aren't compatible with Apple AirPlay. There's a USB input for connecting data storage devices, a dedicated Apple iPod USB input and three SPDIF outputs plus two optical ins. Additional connections include one SPDIF digital output, and variable and fixed stereo outs on the Stream XP and Streamline. The latter two also have Tunein Radio and two upsampling 24-bit/192kHz DACs. Power consumption on standby is less than 1W. It was bound to be only a matter of time before Cyrus joined the likes of Naim and Cambridge Audio in releasing an all-in-one hi-fi streaming system. 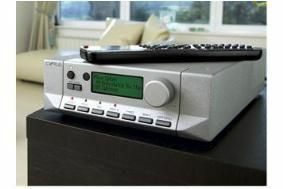 Called the Streamline, it combines a 30W per channel integrated amplifier with a new preamp, USB and iPod connectivity plus five external inputs for connecting a host of digital devices. All you need to add for a complete system is a pair of speakers. It goes on sale in March for £1600. Based on Cyrus's new high-end streaming model, the Stream XP, it enables users to play most files from an iTunes library and wirelessly transmit them around the home. For the best sound quality, Cyrus recommends ripping CDs as uncompressed files. "We always wanted to build a compact audio system," says Cyrus managing director Peter Bartlett. "But until the completion of our streaming project, we haven't been able to deliver the price/performance and sound quality to match our brand standard. "Now we have our new streaming solution, we can amortise the development costs across several models and afford to include a really nice internal stereo amplifier good enough to be matched with very high quality speakers." Streamline is one of three new models in the Cyrus streaming audio range. The flagship model is the Stream XP (£2000) that will form the future core of a new Cyrus high performance system. Joining the Stream XP and Streamline is the Stream X (£1400), a more focused variant using the same core platform but without the preamp. This is designed to provide a streaming source component for customers who already have an amplifier with a built-in DAC such as the Cyrus 8 XPd or DAC XP+ models. During the early development phase of the new streaming range, Cyrus decided it was important that customers should be able to navigate their music library easily. So the company has designed a solution that it says allows intuitive control of the streamer, together with an infra-red learning feature that enables owners to control other devices in the home such as TVs. This network-enabled control system is called n-remote, and it includes a colour screen to provide easy navigation of the audio library, iPod and many other infra-red driven devices. All three Cyrus streaming models will be unveiled at the Bristol Sound & Vision Show later this week.